SUNDAY, March 25 (HealthDay News) -- Want a healthy snack? Consider passing the popcorn. A new study says the whole-grain treat contains more of the "good for you" antioxidants called polyphenols than some fruits or vegetables ...Click here to read more at "What's Poppin'. #4: SNACK ON FIBER-RICH POPCORN - Consuming as little as one cup daily can slash a woman's stroke risk 43%, suggests the landmark Boston Nurses' Study. The fiber in popcorn helps to lower bad cholesterol levels, keeping arteries clear and preventing the formation of the blood clots behind most strokes. ...Click here to read more at "What's Poppin'. HR Poppin' Snacks was recently featured on NTV's "Good Life" with Peggy Malzacher and Zach Ritchie. Watch the video about HR Poppin' Snacks founders Cheryl and Gary Hughes. ...Click here to read more at "What's Poppin'. Ask Us...at HR Poppin' Snacks how to handle gift giving. Our gourmet popcorn is perfect for family, friends, or business associates! Birthdays, holidays, or just for fun... our attractive bags and canisters can be filled with your choice of our delicious gourmet popcorn flavors or try our sugar free gourmet popcorn for a healthy snack. Order individual bags in any of our convenient gift box sizes or choose a canister design and size, then pack it with your choice of delicious healthy and virtually hull free popcorn. Treat yourself or someone else to HR Poppin' Snacks. Now you can reach out and touch us with our new toll free telephone number. We'll be happy to assist you with your order. 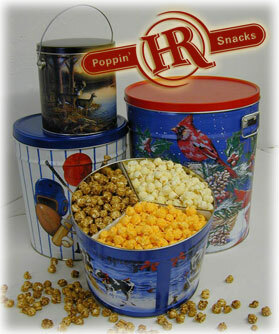 "Nebraska Food & Gift was fortunate to have purchased and promoted HR Poppin Snacks since Dec 1999. We have consistently had quality controlled products delivered to our door that we consider to be 'the best of the best.' 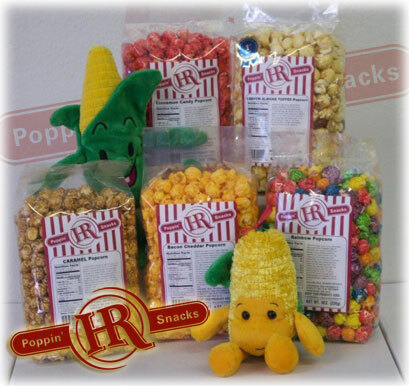 HR Poppin Snacks has a fine diversity of flavors and have been cooperative with timely deliveries for our promotions and customers."